Comic Frontline: Talking Trek 5: Short Trek "Runaway" NYCC Star Trek Discovery Season 2 Trailer! 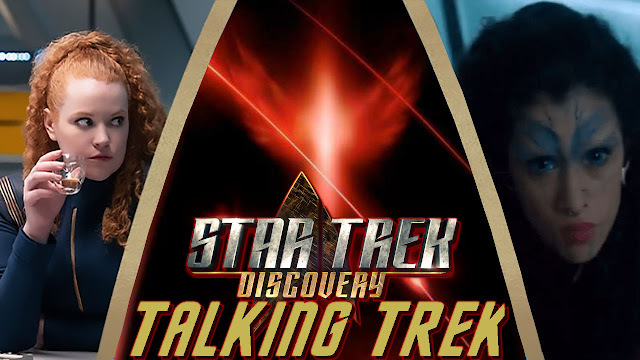 Talking Trek 5: Short Trek "Runaway" NYCC Star Trek Discovery Season 2 Trailer! Welcome to Talking Trek Vidcast where Jay, Comic Book Theater, Jesse JLS Comics, and Justin Padget ExileState Comics does a show where we discuss the latest Star Trek TV and Movie news! This time the crew transport to the Comic Frontline YouTube Channel to discuss CBS All-Access Star Trek: Discovery Short Trek "Runaway", Season 2 News, more Short Treks & More! Calypso – Thursday, November 8 - After waking up in an unfamiliar sickbay, Craft (Aldis Hodge) finds himself on board a deserted ship, and his only companion and hope for survival is an AI computer interface. The Brightest Star – Thursday, December 6 - Before he was the first Kelpien to join Starfleet, Saru (Doug Jones) lived a simple life on his home planet of Kaminar with his father and sister. Young Saru, full of ingenuity and a level of curiosity uncommon among his people, yearns to find out what lies beyond his village, leading him on an unexpected path. The Escape Artist – Thursday, January 3 - Harry Mudd (Rainn Wilson), back to his old tricks of stealing and double-dealing, finds himself in a precarious position aboard a hostile ship – just in time to try out his latest con. Let us know in the comments what you think of this Talking Trek episode and don't forget to follow us on Twitter for the latest Previews, Reviews, News and Interviews!